Within Teamwork Desk you can disable the happiness email that is sent after a customer interaction. Note: This can be disabled on an inbox by inbox basis. Disabling on one will not disable on all. 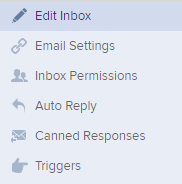 Select the inbox that you want to change it on and select Edit Inbox in the left pane.